Prevent wear and better maintain your floors. Abrading the existing finish with a buffer and then applying a finish coat before your floor's finish is completely worn down will reduce the need for a complete re-sanding. If you care for your floor properly, you can re-coat and delay the need for a complete re-sand and refinish, which will save you a significant amount of time and money. 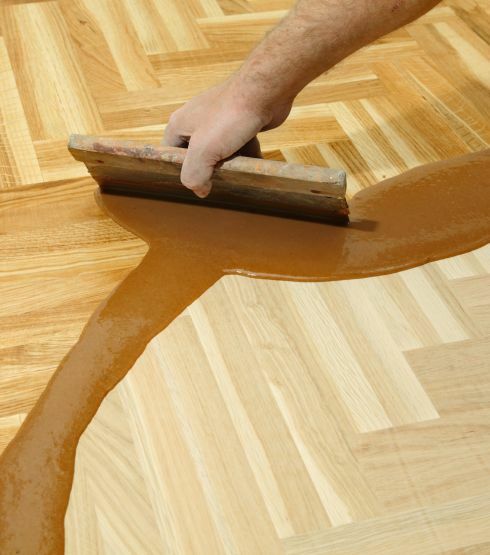 Restore the finish of your floors safely. Sanding the existing finish off to bare wood and leveling the floor is required when the finish is worn or damaged beyond what re-coating can repair. Refinishing your floors properly will restore the natural beauty of your floor to a new appearance and condition. BonaKemi's dust containment systems and non-toxic finishes allow us to re-coat or refinish your floors safely and easily. Eliminating the dust and toxic fumes from the process, Bona's advanced finishing system offers the most convenient, cleanest and safest finishing process available while providing long-lasting beauty and durability for your hardwood floors. Bona DCS™ - Dust Containment System. Using high-powered vacuums attached to the sanding equipment, Bona's innovative system virtually eliminates dust throughout your home that would have been generated during a traditional sanding process. Durable waterborne finishes. Get beauty and durability in re-coating or refinishing and without the toxic fumes; there is no need to move out of your home during the finishing process. These finishes are non-yellowing and will not change color over time. Bona Traffic® - BonaKemi's best finish. It's the toughest, most durable hardwood floor finish ever. Bona™ Eon 70 - With only 70 VOC, it's developed for your environment and formulated for exceptional performance. Bona MEGA® - The #1 selling water-borne hardwood floor finish in the world. You will be back on your floor in no time. Your floor can be walked on with stocking feet in three to four hours, and furniture can be placed (not dragged) in 48 hours. In addition, area rugs can be put down in one week when the finish is fully cured. For a truly natural, durable & "green" choice, we also offer WOCA oil finish, which is the leading plant-based, environmentally responsible, sustainable, nonpolluting, durable wood finish, with no artificial color pigments or preservatives. The European style oil finish provided by Woodcare of Denmark (WOCA) will both penetrate and harden to achieve a very wear resistant finish, which is easily applied and maintained. This type of oil finish has been manufactured in Europe for over 30 years. WOCA oils, containing primarily cold pressed vegetable oils and aromatic hardening oils, penetrate into the surface of the wood floor and, as they cure, harden to form a very protective surface that becomes part of the wood floor. This means that normal wear and tear, such as small scratches and indentations, do not show up as much as on a floor with a urethane finish. The oil finish will also let the wood floor breathe through its surface. Normal cleaning is easy using WOCA soap, simply mixing it with warm water and mopping the floor periodically. As the floor is being cleaned, it is also given added protection against wear and tear. The WOCA soap contains soy and coconut fats, which dry as an invisible film on the surface of the floor and give it added protection. As a result, wood floors finished with WOCA oil finish are not in need of any fancily worded finish warranties. Periodic cleaning and maintenance will make it unnecessary to ever screen or sand your wood floor. A tabletop finish: Each piece of wood flooring sands differently depending on its grain type. Plain or quartered make it virtually impossible for a completely flat surface. Dust free finish: It is not possible to achieve a "clean room" finish. Some dust will fall onto the freshly applied topcoat. Some brush marks may appear in the final coat. A monochromatic floor: Wood, as a natural product and milled from trees, varies from piece to piece and will have grain and color variations consistent with the grade and species of flooring selected. A floor the will not indent: In spite of the term "hardwood", wood flooring will indent under the pressure of high heels (especially heels in need of repair). The finish that is applied will not prevent dents. Walls: There are times when nicks and scratches will happen to the walls and we will do our best in preventing this. Especially along your baseboards, you should expect to have some touch-up painting to do after the floor is completed. Floors without cracks between the boards, or with the Parquet pieces: Although the floor might start out tight together, wood products continue to absorb and release moisture. This natural process will cause the floor to expand and contract from season to season - resulting in cracks between some of the pieces in your floor. Some stain colors, such as white, will show this process more than others.